division-rival Anaheim Ducks on Nov. 16. The 2004 World Cup of Hockey, held during the summer, was an enjoyable affair until the terrorist attack on the school children of Beslan, Russia. The Russian players were devastated and everyone's hearts went out to them. Some Russian players found it difficult to talk about hockey at such a time. Several Russian players -- Alexei Kovalev, Sergei Samsonov and Ilya Bryzgalov, to name a few -- helped shelter their teammates by making themselves available for extended interviews. In doing so, they were asked the same questions over and over again and gamely answered them over and over again. The Russians, understandably, didn't do well in that tournament, but the lasting memory is of Bryzgalov, partially undressed after practice, giving reporters the time they needed, regardless of the outcome of the games. "I'm not sure how good a goalie he is but he's got great character and a good sense of humor," was the consensus opinion of Bryzgalov, who at that point had three AHL seasons under his belt but only parts of two NHL games. That character and humor were again on display Tuesday when Bryzgalov hosted a conference call for hockey reporters after being named the NHL's "Second Star" for the week ending Nov. 25, after posting three-consecutive victories, a 1.62 goals-against average and .938 save percentage. 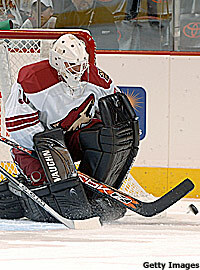 Bryzgalov is undefeated in four games with the Coyotes, who claimed him off waivers on Nov. 17 from the Anaheim Ducks. He has a 1.22 GAA and .954 save percentage in those four games. Bryzgalov was a member of the 2007 Stanley Cup-champion Anaheim Ducks, playing behind Jean-Sebastien Giguere the past two seasons. He played the previous four seasons for the Ducks' AHL affiliate in Cincinnati. Before that, he played for his hometown team in Togliatti, Russia, which is the Detroit or Oshawa of Russia, home to the Lada automobile plant where his father works. Older North Americans remember it as Stavropol-on-Volga. The goalie mask Bryzgalov wore while with the Ducks was one of the best-designed goalie masks in the NHL, featuring cartoon characters Donald, Daffy and assorted other members of the Duck family. But he's 4-0 wearing a plain white helmet in Phoenix. He was asked how long it would be until he had a Coyotes' mask designed. "If we keep winning every game with the white mask, I'll never change," Bryzgalov said. "Just a joke, but the mask is like your face, a part of your soul. When you create a design, it's a part of your soul. You want to show something to the people and have them understand what is on your mask and in your soul." Bryzgalov became expendable after the Ducks signed three-time Swiss League champion Jonas Hiller, 25. Bryzgalov defeated the Ducks and Hiller, 4-3 in a shootout, at Anaheim in his third game with the Coyotes. He had earlier told reporters that Anaheim GM Brian Burke was "a great man" for accommodating Bryzgalov's desire to be a No. 1 goalie somewhere in the NHL. Bryzgalov was very gracious toward the Ducks, their fans and Hiller during the conference call. "When I stepped onto the ice, I didn't feel like it was a special game," he said. "It was something (emotions), but I can't tell you what. I just felt different. I was thinking that one week ago I played for this team and this crowd was on my side. Now, they're for the Ducks while I'm with the Coyotes. Then, the crowd stood up and cheered me. They played a tape filled with moments from when I played with the Ducks. "That was a great moment in the game and I was near crying because I didn't expect it. Seventeen thousand people stood up and cheered! But, it's still a game and we're all professionals. It's important to win the game. I play for the Coyotes now and we have to win. I have no friends during games. We need the points, no sharing! "Jonas is a good guy," Bryzgalov continued. "And, he's got the opportunity to be the backup. I didn't feel any special feelings toward him, any special competition with him. We play a team game, not goalie agaianst goalie and forwards against forwards. We have to beat a team." Bryzgalov's ability to understand English is very good but, like almost anyone in a second language, he struggles for the right word now and then. He proved Tuesday that's he's adept at slipping tough questions. Try as they may, the reporters couldn't get Bryzgalov to say anything negative about the Dcuks, Hiller, Burke, etc. "I want to say thank you to the Ducks," he said. "Thank you for everything they did for me. They are a great organization with great people. I have no issues and no reason to blame the team or management. I had great teammates there and great management. I have no complaints with anything that has happened. I had a great time and when I had a chance to play, I played hard and tried as much as possible to help them win. "We won a Stanley Cup, an unforgettable moment, and the whole team got silver (replica) cups and rings. I was a part of that. "I brought the Stanley Cup to my hockey school where I grew up. Kids who play hockey now could take their picture with the Stanley Cup. Then, I brought it to my dad's work at the car factory. People who worked with my dad got to be with the Cup. Then, we had a little private time. We rented a boat, my family and me, and went swimming in the Volga River with the Stanley Cup. We brought the Cup to the Sports Palace so everyone in the city could see it and finished up with a private party for 150 people. We had fireworks at the finish." The four-straight victories helped the Coyotes to go over .500 with an 11-10-0 record. Phoenix fans will love his attitude. "You have to earn this job," he said. "It's not a right to be a No. 1 goalie. I have to prove it every day, in practice and in the games. It's so tough to get this job and so easy to lose it. I have to work hard. I have different feelings right now, I'm so excited to get this opportunity to keep working hard and help this team make the playoffs. "We have a good defense here -- some young and some veteran. They have played really well in front of me. They're working hard and have good talent." The Coyotes, in turn, have been impressed with Bryzgalov's work ethic and his demands to face their hardest shots in practice. "It's just how you have to prepare for a game," he said. "I just want to challenge every player, every shot because I don't want anyone scoring on me anytime. I had a coach in Russia who said you can't stop every shot, if you want to give up a goal in practice, give it up. And he would work us for a few minutes and rest us because you're not stopping shots continuously through a 60-minute game. I think that's the wrong philosophy. It's different in practice when you can be tested from different angles and different shots. I keep working to stop all the shots because it's good for my confidence and the team's confidence. When teammates see you working hard, it gives them confidence." Coyotes GM Don Maloney acquired Bryzgalov with the plan that he'd be the No. 1 goalie. It's obvious from Maloney's words that the job is Bryzgalov's to lose. They seem to be on the same page. "At the end of the day one guy has to be responsible for the team, and it just seems it’s more of the norm now that the one guy ends up playing 60-70 games or whatever that number is," Maloney told NHL.com's Dan Rosen. "'Bryz' has played in the league and had success, especially in the playoffs. The question is now, can he do it in a 60-game span and be the guy that plays in 50 of them?"